Any time we can get a window into the world of professional racing that we don’t typically get, we love it. In this case it is a video featuring radio communications from a bunch of the NASCAR teams competing at the race in Atlanta last weekend. The radio seems to be in constant use by these teams because you have a spotter talking to the driver almost constantly, you have a crew chief talking to the driver about the condition of his car, and you have a driver who is either asking questions, sharing information, or bitching about everything from the car setup to the other competitors on the track. Good stuff! There are a couple of real gems in this one, including a crash in the pits that angers not only those involved but everyone else in the race because the leaders got closed up on and the guys who were making a run at them suddenly found themselves bunched back up in a load of traffic. The best part is that the guy driving the car that started the mess owned up to it with the comment, “I was looking at the tach…unghhhhh”. There’s an interesting point raised by both Martin Truex Jr and Clint Bowyer here. That’s the idea that lapped cars who are not in contention to win the race should get out of the way of cars that are contenting. 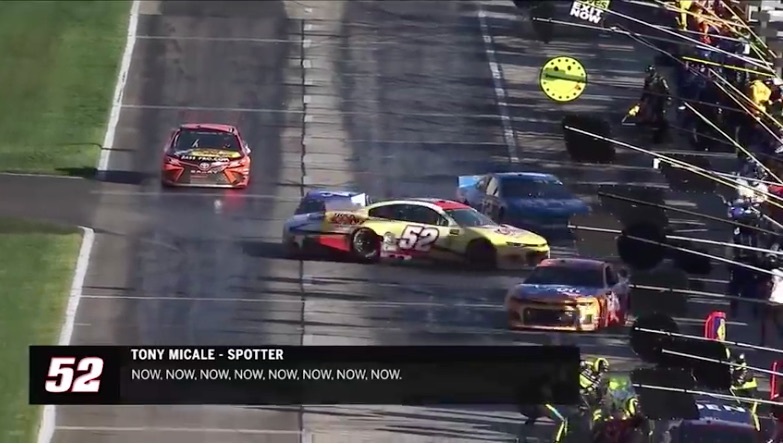 While we can certainly see the point of the leaders wanting to race unabated to the finish line, if something like this is to be implemented, you might as well just remove cars from the race who are not performing before the end, right? The guy in last place has as much right to the race track as the guy in first and if you cannot pass him, that’s your fault. At least that’s our take. Watch this and tell us what you think? If they’re REALLY concerned about safety in the pits it would help to put speedometers in the car. Make everyone slow down and enforce real penalties. You would see a lot less of this type of accident. They use the tachometer, it’s the same difference.